Chiadambaram Temple also known as Thillai Nataraja temple is a sacred saivite shrine of Shiva located in Chidambaram,Tamil Nadu,at around 230 kms from Chennai.The temple dates back to 12th and 13th centuries.It is the primary shrine of the 275 Paadal Petra Sthalams ( Shiva Sthalams glorified in the early medieval Tevaram poems by Tamil Saivite Nayanar saints Tirunavukkarasar, Thirugnana Sambandar and Sundarar). 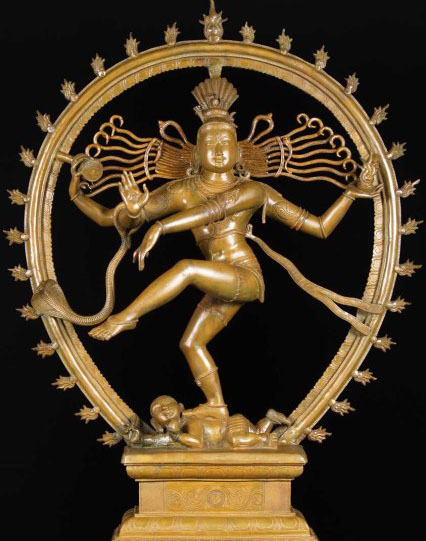 The name of the Lord here is Nataraja or Thillai Koothan and the name of the Goddess is Sivakami Amman. Chidambaram is one of the Pancha Bootha Sthalams (five holiest Shiva temples), each representing one of the five natural elements. Chidambaram represents akasha (upper sky). The other four temples are Jambukeswara at Thiruvanaikovil,near Trichy (water), Ekambareswara (earth) at Kanchipuram, Arunachaleswara or Annamalai (fire)at Thiruvannamalai and Kalahasti Nathar (wind) at Kalahasti. Chidambaram's ancient past This is a major shrine of Lord Shiva worship since 12th century.There have been several renovations and offerings to Chidambaram by the Pallava, Chola, Pandya, Vijayanagara and Chera emperors in the ancient and pre-medieval periods. Its bronze statues and stone sculptures depicting various deities reflect the early Chola and Pallava art while its famed gold plated gopuram towers are later additions. Chidambaram is the birthplace of the sculpture and bronze image representation of Lord Shiva as the cosmic dancer, that has since become notable as a symbol of Hinduism. 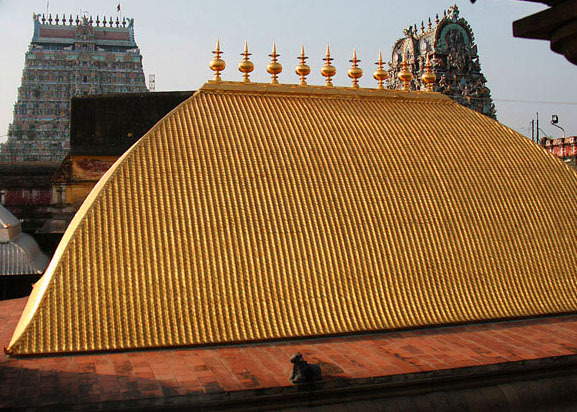 The gold roofed shrine is the only Shiva temple to have its main deity represented in this anthropomorphic (human) form,Sakala Thirumeni as the supreme being who performs all cosmic activities. Two other forms of Lord Shiva are represented as a crystallised lingam , Sakala nishkala thirumenithe most common representation of Lord Shiva in temples, and as the aether (vaccum-space) ,Nishkala thirumeni represented with empty space and a garland of fifty one hanging golden bilvam leaves (Vilvam). Lord Shiva is captured in pose as Nataraja performing the Ananda Tandavam ("Dance of Ecstasy") in the golden hall of the shrine called Pon Ambalam (Golden hall). The sculptures of Chidambaram inspired the postures of the classical dance,Bharatha Natyam. The Chidambaram complex is admired for its five famous halls (ambalam or sabhai).There are other shrines to deities Ganesha, Muruga, Vishnu (this is one 108 Vaishnava divya desams) and Sivakami Amman. The temple is managed and administered hereditarily by the Chidambaram Dikshitars,a class of Vaideeka Brahmins whom, legends say, were brought here, from Mt. Kailas, by Saint Patanjali, specifically for the performance of the daily rituals and maintenance of the Chidambaram temple. These Deekshithars follow the Vedic rituals, unlike the Sivachariyars or Adhisaivars, who follow the agamic rituals for the worship of Lord Shiva. The rituals for the temple were collated from the Vedas and set by Patanjali. The day begins with the Lord’s footwear (padukas) being brought at 7:00am from the Palliyarai (or bedroom) to the sanctum sanctorum in a palanquin accompanied by devotees with cymbals and chimes and drums. The Priest then begins by performing the daily rituals with a yagna and a ' Kho pujai' (worship of cow). Pooja is done 6 times in a day. Before each pooja, the Spadika linga (Crystal linga), is anointed with ghee, milk, curds, rice, sandal paste and holy ash. This is followed by presenting the neivedhyam or offering of freshly prepared food and sweets to the Lord and the deeparaadhana, by showing varied and decoratively set lamps, the reciting of Vedas in Sanskrit and the Panchapuranam (a set of 5 poems from a set of 12 works in Tamil ,called the panniru thirumurai). The pooja ends with the priest parting the curtains of the sanctum sanctorum to reveal the Chidambara Rahasyam. Before the second pooja, apart from the regular anointing of the crystal linga, Nataraja deity made of ruby ( Rathinasabhapathy) is also anointed. The third pooja is at noon, after which the temple closes until around 4:30pm. The fourth pooja is performed at 6.00 PM, the fifth at 8:00pm and the last pooja of the day is performed at 10:00pm, after which the Lord’s footwear is taken in a procession for Him to ‘retire’ for the night. Before the 5th pooja at night, the priest performs special rituals at the Chidambara Rahasya, where he anoints the yantra with aromatic substances and offers 'neivedhyam'. The last pooja, called the Arthajaama pooja is done with special fervor. It is believed that the entire divine force of the universe retires into the Lord, when he retires for the night. Important Festivals Just as six poojas are performed in a day at the sanctum sanctorum, six anointing ceremonies are performed for the principal deity in a year. They are the Marghazhi Thiruvaadhirai (in December - January ) , the fourteenth day after the new moon ( chaturdasi) of the month of Masi ( February - March), the Chittirai Thiruvonam ( in April- May), the Uthiram of Aani (June- July) also called the Aani Thirumanjanam , the chaturdasi of Aavani (August-September) and the chaturdasi of the month of Puratasi ( October - November). Of these the Marghazhi Thiruvaadhirai ( in December-January) and the Aani Thirumanjanam ( in June-July ) are the most important. These are conducted as the key festivals with the main deity being brought outside the sanctum sanctorum in a procession that includes a temple car procession followed by a long anointing ceremony. Several thousands of people flock the temple to see the anointing ceremony and the ritualistic dance of the Lord when He is taken back to the sanctum sanctorum. 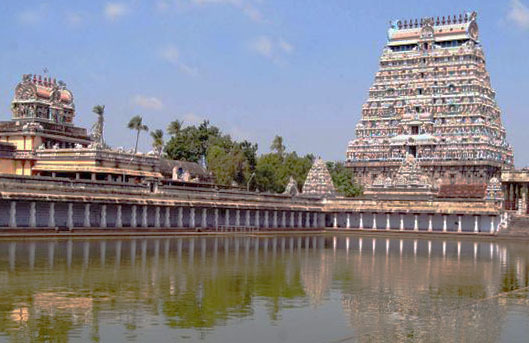 Chidambaram is well connected by roads and railways.It is on the East coast road from Chennai to Pondicherry,85 kms before Pondicherry The nearest airport to Chidambaram is Tiruchirappalli at a distance of about 195 km or Chennai which is 235 kms. Where to Stay? There are several budget hotels to semi deluxe hotels in Chidambaram. Other interesting places around Chidambaram. The mangrove lakes of Pichavaram (with Thillai trees),Sirkazhi, Thirukadaiyur,Thirunallar,Vaithesswaran Koil.